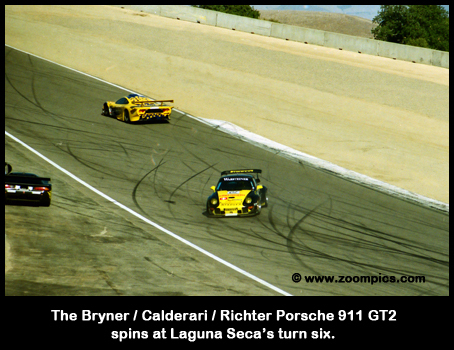 The FIA GT race at Laguna Seca was the final event of the 1997 championship and the second appearance of these cars in the U.S. The previous weekend teams had endured a very wet Sebring, which meant the sunshine of northern California was a welcome change. The FIA GT Championship was announced in the Fall of 1996 evolving from the BPR GT series. Responsibility for the new championship was assigned to Stéphane Ratel who was one of the original founders of the BPR series. 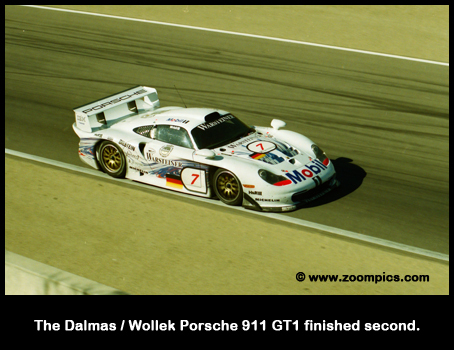 The 1997 championship consisted of two classes - GT1 and GT2. GT1 vehicles are probably best described as "Supercars" and included the McLaren F1 GTR, Mercedes-Benz CLK GTR, Porsche 911 GT1, Panoz GTR and Lotus Elise GT1. Despite the perception associated with Supercars as unrestricted vehicles where "anything goes" some rules were implemented. The selling price of both street and race versions of the vehicles could not exceed $1MM. There was even a limit on the price of replacement parts. The collection of parts required to assemble a car could not exceed 150% of the original vehicle cost. Homologation standards were also set for the number of vehicles and engines produced. Not only were manufacturers required to make their cars available to several competitors but also any improvements made to factory entered vehicles had to be offered to all teams racing their model. In an effort to provide rules stability, published technical regulations were applied for three years and any notification of new changes would be given a year in advance. The GT2 class included the Porsche 911 GT2, Chrysler Viper GTS-R, Marcos LM600 and Ford Saleen Mustang. GT2 cars were also required to meet homologation and availability standards. Unlike GT1, these cars were allowed anti-lock braking systems but not carbon-fiber brakes. To distinguish between the two classes GT1s were required to use red colored numbers between 1 and 50 and white headlights. Black numbers greater than 50 and yellow headlights were required for GT2 competitors. Little testing took place prior to the first practice session because of the 3,000-mile trek from Florida and time required to make repairs to some of the cars. 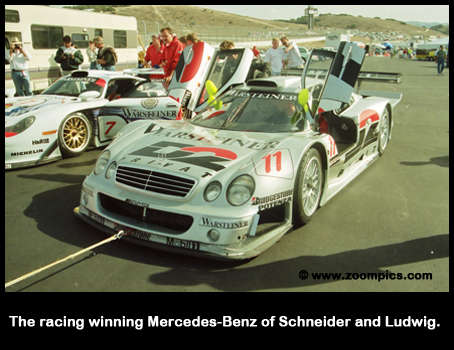 Track time was critical as this was the first visit to Laguna Seca for many teams and drivers and only one of the four championships had been decided. Porsche dominated practice, however, the tables were turned in qualifying. The pole was captured by Alexander Wurz who turned a 1:17.941 - in fact he was the only driver under 1:18. 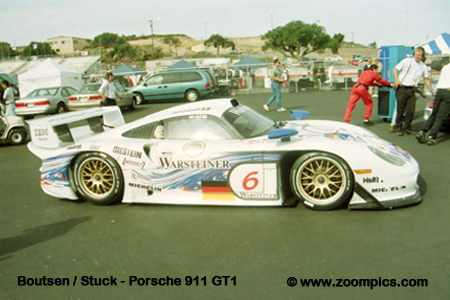 Wurz shared the AMG Mercedes CLK GTR with CART competitor Greg Moore who had also made a guest appearance at Sebring. The addition of Moore was the result of his CART's team connection with Mercedes-Benz. This was Wurz's last race with Mercedes, in 1998 he would join the Benetton Formula 1 team. Second fastest was championship points leader and Wurz's usual partner, Bernd Schneider. Klaus Ludwig was paired with Schneider for the Laguna Seca and Sebring rounds. Marcel Tiemann and Alessandro Nannini also in a Mercedes qualified third, 0.169-seconds behind Schneider and Ludwig. Fourth and fifth positions on the grid were occupied by two factory-entered Porsches. Allan McNish and Ralf Kelleners out qualified regular Porsche drivers Yannick Dalmas and Bob Wollek. 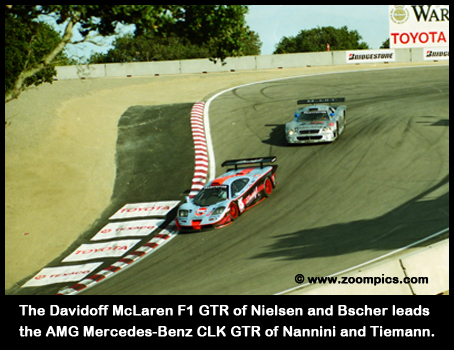 Separating the third factory Porsche were Roberto Ravaglia and Peter Kox in the BMW Motorsport McLaren F1 GTR. This was quite an impressive feat as the duo was using a car originally intended for the Toyko Auto Show. J.J. Lehto and Steve Soper's McLaren was destroyed by fire at Sebring and since they were championship contenders they were given the Kox/Ravaglia car. Seventh on the grid were veterans Hans Stuck and Theirry Boutsen in the third factory Porsche. The fastest Panoz was the DAMS entry, in ninth, driven by Eric Bernard and Franck Lagorce. Starting eleventh was Mike Hezemans and Jan Lammers in the first Lotus. GT1 had all the ingredients for an exciting race - three different manufacturers in the first seven starting spots with less than a second separating them. The scenario at the front of the GT2 grid was similar to GT1 - three different manufacturers qualified in the first five positions and were separated by less than a second. During much of the season, GT2 qualifying was dominated by the Team Oreca Chrysler Viper's, however, Cor Euser driving a Marcos LM600 with Harald Becker captured the pole. Euser turned a 1:24.883 finding the Marcos was well suited to Laguna Seca's fast corners. They were followed by the contenders for the GT2 Drivers Championship, Philippe Gache and Olivier Beretta in the Team Oreca Viper and Bruno Eichmann in the Roock Porsche 911 GT2 which he shared with Stephane Ortelli. Fourth on the grid and also in contention for the Drivers title was Claudia Hurtgen sharing her Roock Porsche with Uwe Alzen. 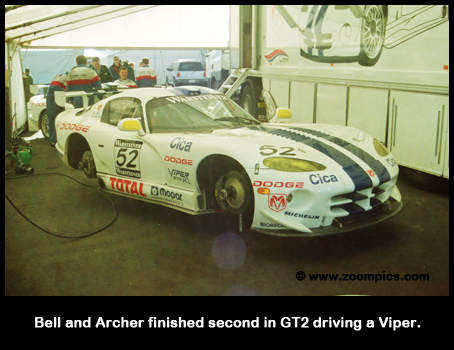 Starting fifth was the second Team Oreca Viper of championship leader Justin Bell and Tommy Archer. Qualifying seventh in GT2 was the Cirtek Ford Saleen Mustang driven by Robert Schirle and Christian Vann. The team crashed at Sebring and had to take a detour to the Saleen factory before arriving at Laguna Seca. Schirle acknowledged that the team was lucky their accident occurred in America. 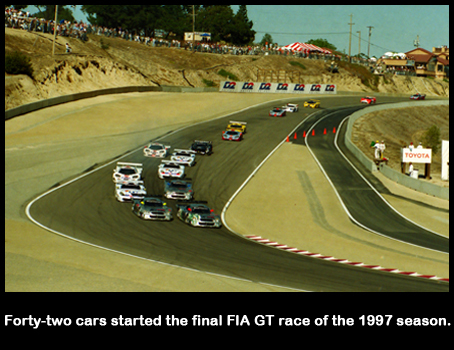 The final event of the 1997 FIA GT championship was a 3-hour race run in front of an estimated 45,000-spectators. As Mercedes controlled the front of the grid their game plan was for polesitter Wurz to relinquish the lead to points leader Schneider in the first corner. However, some confusion between the Mercedes drivers allowed Allan McNish to slip his Porsche 911 GT1 into the lead. McNish would maintain the lead throughout the first hour with Schneider in close pursuit. Wurz trailed McNish and Schneider in the early stages but encountered problems in the first hour when he tangled with the GT2 Porsche of Wolfgang Kaufmann. This resulted in a lengthy pit stop, which dropped him back to 25th. The third factory Mercedes driven by Alessandro Nannini was rear-ended by the Porsche of Thierry Boutsen. Nannini went down three laps when he pitted to have the tail replaced and Boutsen lost two laps to have the nose changed. It was during the first round of pit stops that the complexion of the race would change. McNish made his stop and the Porsche crew had problems with the wheel nuts on his car. This extended his time in the pits and eliminated his chance of winning. Schneider pitted turning the driving duties over to Ludwig. The team decided not to change tires which allowed Ludwig to return to the track with the race lead. In the final round of pit-stops, Schneider took over the driving duties from Ludwig and cruised to an 18-second victory. All the drama among the top qualifiers and a consistent run allowed Dalmas and Wollek to finish second. McNish and Kelleners were able to rebound from their early troubles to finish third. First among the privateers and fourth overall were Jean-Marc Gounon and Pierre-Henri Raphanel in a McLaren. They ran in third place for much of the final hour, however, they chose not to change their tires during the last pit stop. With their tires quickly fading they were easily overtaken by McNish and Kelleners' car. 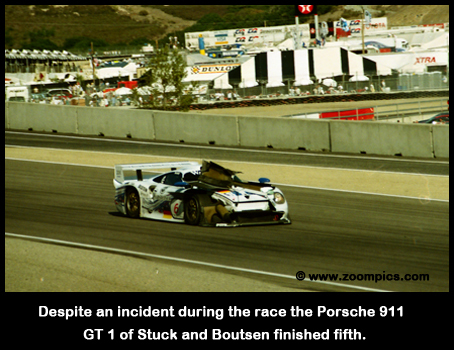 Another team able to overcome their early race adversity was Boutsen and Stuck, who managed a fifth. The top Panoz, driven by David Brabham and Andy Wallace, finished sixth. The team had experienced braking problems during qualifying and in an effort to improve the cooling of the rear brakes the mechanics opened up the air ducts in the bodywork. The scrutineers found the modifications unacceptable and in post-race tech, the Brabham and Wallace car along with fourteenth place finishers Olivier Grouillard and Perry McCarthy were disqualified. The Wurz/Moore duo charged through the field after their incident, which netted them a seventh place finish. Championship contenders Lehto and Soper didn't fair so well. For the race, Lehto was paired with Kox and they completed only 12-laps before the car overheated. Ravaglia tangled with a GT2 car, which required repairs and Soper lost time after contact with the Parabolica McLaren so they finished in eleventh place. In the end Schneider's win, Mercedes' sixth of the 11-race FIA GT season guaranteed both the GT1 Drivers title for him and the Teams title for AMG Mercedes. Schneider finished the series 13 points ahead of championship rivals J.J. Lehto and Steve Soper. AMG-Mercedes bested Team BMW Motorsport by a margin of 25-points. The drama that played out in GT1 only made the conclusion to the championship more predictable, however, this was anything but the case with GT2. 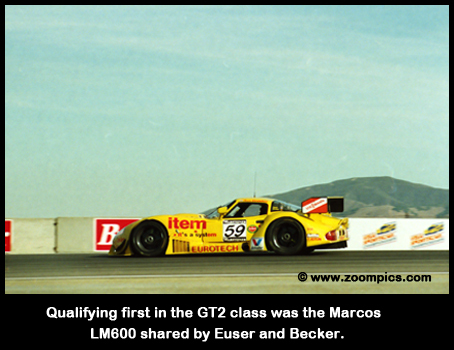 Despite qualifying on the pole, the Marcos of Euser and Becker would not be a factor in the race. At the start, it was the Gache and Beretta, Team Oreca Viper, that took control of the race and appeared headed for the title. But a time penalty for speeding in the pit lane left them trailing their Roock Porsche contenders. This put the Roock team in control as Eichmann led followed by Alzen and the Team Oreca Vipers of Beretta and Gache and Bell and Archer. To capture the championship Eichmann had to win the race and points leader Bell would have to finish third or worse. However, with less than thirty minutes before the finish of the race, the second place Roock Porsche driven by Alzen retired with mechanical problems. With time running out the Oreca boss, Hugues de Chaunac instructed Beretta to slow down and allow Bell past. The team had reached an agreement prior to the race that if Beretta and Gache could not win the championship they would let Bell pass. On the final lap Beretta slowed allowing Bell by to take the championship. The Roock duo of Eichmann and Ortelli had won the battle but not the war. The factory Vipers took second and third with the Chamberlain Viper of Richard Dean and Tim O'Kennedy finishing fourth. They were followed by the Krauss Motorsport and Dellenbach Porsche GT2s. In the space of 3-hours four different competitors appeared destined to win the GT2 Drivers title but in the end, Bell took the championship by a single point over Eichmann. The Viper Team Oreca finished a comfortable 43-points ahead of Roock for the Team title.